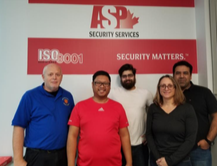 We are pleased to announce that starting in January, 2019, Use of Force and Standard First Aid/CPR/AED, along with several other courses, will be delivered in-house at A.S.P.’s downtown Toronto office. Many thanks to LSSTG Master Trainer, Kevin Vandeyck, Ph.D. for partnering with A.S.P. to certify our trainers. We are very grateful to Kevin for sharing his wealth of knowledge gained through many years of teaching Use of Force in the security industry. The instructor course was very comprehensive, challenging and fun! Standard First Aid/CPR/AED will also be offered in-house starting in January as members of our team complete their instructor certifications with Rescue 7. Tactical Communications, Customer Service and Edged Weapons. Please contact Lisa Marsan for a training calendar and to register for courses.